My favorite books by first time authors are those that you would never know were first novels. 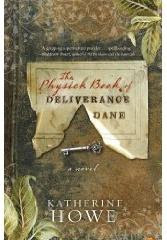 Katherine Howe has accomplished this feat with her first novel, The Physick Book of Deliverance Dane. With the encouragement of her friend, author Matthew Pearl, Howe has imagined a glimpse into the history of American witchcraft. Connie is a graduate student at Harvard who specializes in colonial America. When she is asked by her mother to go through her deceased grandmother's possessions and clean her house for sale, Connie is unwittingly drawn into a mystery from the past. She finds a key in an old bible and rolled inside the stem of the key is a slip of paper with the name "Deliverance Dane" on it. After some research, she finds that Dane may have left behind a "physick book" or book of spells after her execution in Salem. Connie sees the book as her chance for an amazing doctoral dissertation but it turns into a quest for so much more. In my opinion, this book was really successful because of Howe's inclusion of scenes from the past with Dane, her daughter and her granddaughter. They give the reader information that Connie would never have been able to find through her research. This allows for a sense of completeness to the story that wouldn't have been there if it was strictly written from the modern perspective. My only problem with the story were the few times that I seemed to piece together the clues faster than Connie did -- and she was supposed to be a semi-expert in the subject! I don't know if she is supposed to have been clouded by her anxieties and stress or if I just have the advantage by being a semi-expert in mystery novels. ::wink:: Otherwise, this is a strong novel about a very interesting (though dark) period in American history. This book will be released next week (June 9). Buy The Physick Book of Deliverance Dane on Amazon or find it at your local library. I have a copy of this that I hope to start reading this weekend. This is the kind of book I usually either love or find ridiculously annoying, so it'll be interesting to see how I feel about this one! Teresa - I can't wait to read your review when you finish! I too was surprised that this work was written by a first-time author. It proved to be a very enjoyable read for me, which is sometimes difficult to do! I agree that the "clues" became a bit obvious and predictable, however I found myself still wanting to turn the pages for validation of my suspicions. Great book and definitely one I would also recommend! Thank you for your review, Kristen. Author of "Midnight Omen Deja vu"